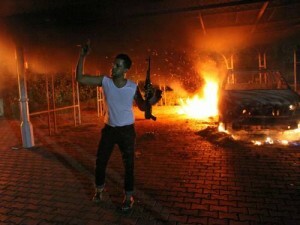 An armed man stands outside the US Consulate in Libya as it burns in September 2012. Photo: Twitter. Politico – In their long-awaited final report, Republicans on the House Benghazi Committee concluded that the Obama administration — including then-Secretary of State Hillary Clinton — failed across multiple agencies and levels to protect American diplomats in the 2012 Benghazi terrorist attack. The 800-page report was released on Tuesday, and marks the culmination of a two-year investigation that has haunted the 2016 Democratic front-runner on the campaign trail, even as Clinton’s campaign has consistently slammed the probe as a political vendetta.